This unassuming strip of Lake Ontario shore was once the scene of a destructive British raid during the War of 1812. The Battle of Troupville was fought on the evening of June 19, 1813 between a British raiding party and American militia commanded by Captain Elias Hull at Sodus Point, New York during the War of 1812. It was initially a victory for the Americans, but the next day British troops returned and successfully raided and burned the village. Lake Ontario was a strategic conduit for ships and supplies during the war, and both sides sought to control it. The American government kept military store houses at various points along the lake. On June 15, 1813, the British destroyed one storehouse in the village of Charlotte (today a neighborhood of Rochester), at the mouth of the Genesee River. Two militia units were called out, and residents of Troupville buried anything they thought the British might steal or destroy. On the morning of June 19, however, since no British ships had appeared, the militia disbursed. As fate would have it, that night under cover of darkness approximately 125 British soldiers came ashore and around 60 men from the village grabbed their rifles to meet them. They initially chose Elder Seba Norton, a preacher and veteran of the Revolutionary War, as their leader, but Captain Elias Hull of the militia soon arrived to take command. The battle was short. The American militia, hiding in the woods, exchanged fire with the British, but neither side could see how many men they were facing, and both sides retreated after firing a few rounds. Two British soldiers were killed, and two Americans were mortally wounded and three captured. An unknown number were wounded. The next day, British ships fired cannon into the town and landed unopposed. They burned every building but the tavern (where they had left a wounded militiaman the night before) and sailed away. The 1969 Woodstock Music and Arts Festival, hosted by Max Yasgur on his 600 acre dairy farm northeast of Bethel, Sullivan County, New York, has become an iconic moment in recent American history. The three day concert was, by many accounts, the defining event of 1960s counterculture. Over 300,000 people came out to see iconic musicians like Arlo Guthrie, Joan Baez, Santana, Grateful Dead, The Who, Jefferson Airplane, The Band, and Jimi Hendrix. Today, a concrete memorial marks the location of the sound stage. In 2006, the sleek Bethel Woods Center for the Arts opened nearby, which features a concert venue and museum of 1960s counterculture. The museum is quite nice, but I got a chuckle out of seeing a bunch of elderly baby boomers holding a corporate event there, complete with waitresses serving hors d’oeuvres. A far cry from the ideals they promoted in their idealistic youth. A modern, high-tech museum dedicated to the backbone of the United States Army features detailed dioramas and informative displays from all eras of U.S. military history. Fort Benning, outside Columbus, Georgia, is named after Confederate Brigadier General Henry L. Benning. It is home to the United States Army Infantry School and Basic Combat Training for most infantry recruits, so it is generally recognized as the traditional home for U.S. infantry. It comes as no surprise that the National Infantry Museum is located there. The museum used to be in a former Army hospital on base, but in 2008 the National Infantry Foundation, in conjunction with the U.S. Army, built a brand new museum on a 155-acre campus just off post. The 190,000 square foot state-of-the-art museum, featuring combat simulators, dioramas, a theater, a restaurant, and over 100,000 historical artifacts, opened in 2009. It’s hard not to be in awe walking through displays spanning the history of U.S. conflicts from the Revolutionary War to the present day. The dioramas feature real military equipment, lights, and sound. There’s even a section where you can walk through a simulated Vietnam jungle while listening to a narrator describe what it was like to be there. Built between 1896 and 1910, the Ohio State Reformatory in Mansfield served as a detention center for young, petty criminals. The first inmates were admitted in 1896, and they helped construct the Romanesque Revival building. The reformatory closed in 1990 and was used most famously in the filming of The Shawshank Redemption (1994). Today it is open for tours, and has attracted a reputation for being haunted. The old superintendent’s office, where disembodied voices are heard, is widely believed to be haunted by the ghosts of Helen and Warden Glattke. In the basement, the ghost of a 14-year-old boy who was allegedly beaten to death has been reported. 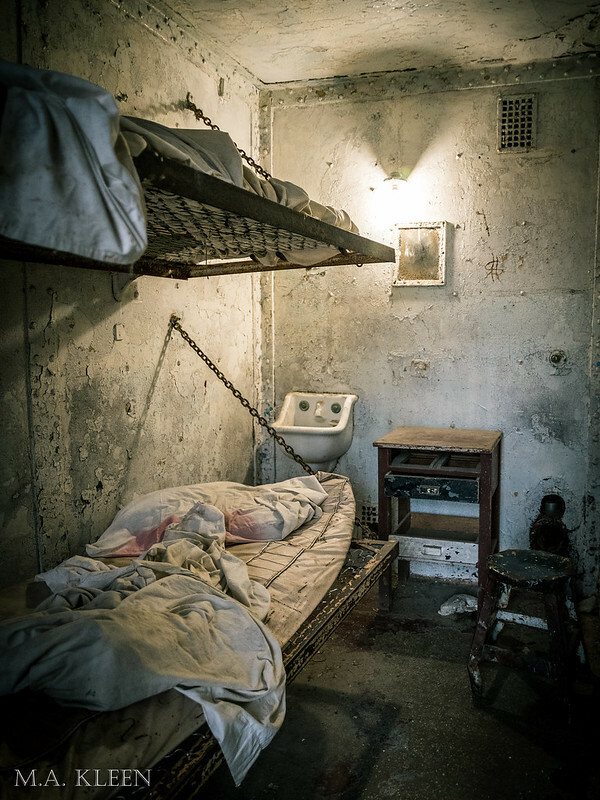 Visitors often experience strong feelings of dread, anger, and fear throughout the former reformatory. One form of punishment was to send prisoners to solitary confinement in “the hole”—a dark and claustrophobic room—for an indeterminate amount of time. We filmed my 60-minute documentary on Tinker’s Swiss Cottage in Rockford, Illinois, Tinker’s Shadow: The Hidden History of Tinker Swiss Cottage, over about a period of a week last December. Tinker Cottage is a wonderful Victorian house museum with a long history of unusual occurrences many attribute to the ghosts of Robert H. Tinker and his family. The museum’s former executive director, Steve Litteral, is a good friend of mine, as are many of the cast and crew. I was so lucky to know and work with such a talented and knowledgeable group of people, including Chicago-based photographer Greg Inda, who served a dual role as cameraman and directory of photography. Amelia Cotter of the R.I.P. Files agreed to host. I released the documentary on Amazon Video Direct in March 2018 and we had a public showing at the museum in July. It’s now available on DVD, but the digital version is the highest quality. Please check it out if you haven’t already; it’s perfect for the Halloween season. Unexplained events at a Midwestern museum shed light on its city’s past in Tinker’s Shadow: The Hidden History of Tinker Swiss Cottage! Perfect for the Halloween season, check it out on DVD or Video Direct on Amazon.com. We filmed this 60-minute documentary last Christmas and released it in April. I think it turned out very well and we’ve had a lot of positive feedback. Tinker Swiss Cottage Museum & Gardens in Rockford, Illinois has long been rumored to be haunted, but what do its ghosts teach us about the past? Join host Amelia Cotter as she takes you inside and reveals the hidden history of this beautiful museum. Featuring interviews with museum staff, visitors, volunteers, and researchers. Compared to modern warships and aircraft carriers, the USS Constitution might not look like much, but it was once the most storied ship in the U.S. Navy. It was launched on October 21, 1797, and is still considered to be in active service. The USS Constitution was originally a 44-gun frigate with a crew of 450 sailors, including 55 Marines. She earned the nickname “Old Ironsides” during the War of 1812. Today, she is still crewed by 60 active duty U.S. Navy personnel, though she has been in dry dock at the former Charleston Navy Yard in Boston under restoration for the past three years. The USS Constitution Museum is a private, nonprofit museum located in a restored shipyard building nearby. It is a first class effort at telling the USS Constitution’s history through art, models and dioramas, hands on displays, and volunteers.